Fishes dinner on Christmas Eve. 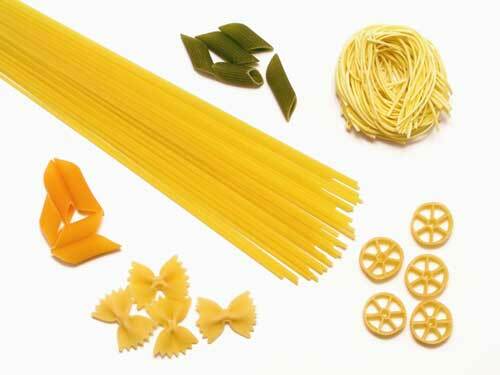 The pasta used in Pasta with Sardines is typically a long hollow pasta such as bucatini or perciatelli. In Italy, wild fennel is used and also fresh sardines. Since it is usually difficult to find fresh sardines in the US, this recipe substitutes canned sardines. Heat a small skillet; toast the pine nuts until lightly golden, 3-4 minutes. Transfer the nuts to a small plate; set aside. Add 1 tablespoon of olive oil to the skillet; add the breadcrumbs. Stir the breadcrumbs over medium eat until golden, 3-4 minutes. Transfer to a plate and set aside. Remove the fronds from the fennel, chop them, and set aside. Remove the core from the fennel bulb; coarsely chop the bulb. In a large skillet, heat the olive oil over medium heat. Saute the onions, garlic, and chopped fennel bulb until lightly golden, about 5 minutes. 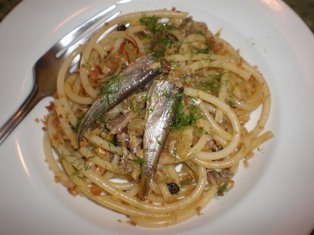 Add the anchovies and half of the sardines; stir to break up the sardines and anchovies. Add the currants and toasted pine nuts. Cook the mixture for about 5 minutes. Scoop a ladle of the pasta water into the sardine mixture. Stir in the saffron; season with salt and pepper. Cook for 1-2 minutes. Drain the pasta, reserving some of the cooking water. Add the drained pasta to the sardine mixture in the skillet. Stir pasta well to coat with the sauce. Gently stir in the remaining sardines. 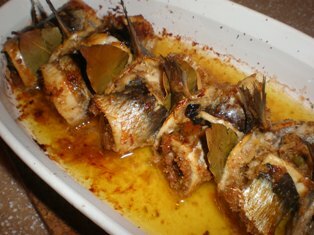 Allow to cook for another minute, just to heat the added sardines. Add some of the reserved pasta cooking water if the sauce is too dry. Transfer the pasta to a serving dish. Sprinkle some of the toasted breadcrumbs and chopped fennel fronds on top. Serve, passing the remaining breadcrumbs to be added, if desired. 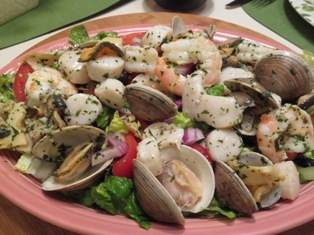 Finely chop 6 anchovy fillets; cut the remaining 6 into 1/2-inch pieces; set aside. Cook the pasta in boiling salted water until al dente. While the pasta is cooking, heat the olive oil in a large skillet over medium-low heat. Add the garlic, red pepper, and finely chopped anchovies. Cook, stirring until the anchovies dissolve. Remove the skillet from the heat. Stir in the parsley and remaining anchovies. Reserve 1 cup of the pasta water and drain the pasta. Add the pasta to the skillet with the anchovy sauce. Toss until the strands are well coated. Add some of the reserved pasta water if the mixture seems too dry. Set aside 2 tablespoons of the toasted bread crumbs. Add the remaining crumbs to the skillet and toss the pasta again. Transfer the pasta to individual serving bowls. Top each serving with a sprinkling of the reserved bread crumbs. Toasted breadcrumbs can be made by sauteing them in a skillet or baking them in an oven. Warm 2 tablespoon olive oil in a 10-inch skillet over medium heat. Add 3/4 cup of fresh breadcrumbs and stir to coat with oil. Cook, stirring constantly, until the crumbs are golden brown and crunchy, about 5 minutes. Place 3/4 cup of fresh bread crumbs in a bowl with 2 tablespoons olive oil. Using your hands, gently combine the ingredients. Spread the breadcrumbs on a baking sheet and place in a 350 degree F. oven. Bake about 8 minutes, stirring a couple of times, until golden brown and crisp.